December is riddled with dinner parties and friend and family get-togethers. While I love a good reason to eat great food and spend time with loved ones, there is always pressure on me to bring a fabulous dessert. Truth be told, the largest contributor to the pressure is myself. I want to find a way to outdo myself, to wow the guests with unexpected flavor combinations or an elaborate dish. The baker inside me wants to be a bit of a show-off. However, as time has shown me again and again, the pressure I place on myself to perform tends to backfire. For Thanksgiving a couple years ago, I created a wonderful caramel pumpkin bread pudding. It took me two attempts to get it right, once because I burned the pudding in the oven and the second because I burned the caramel on the stove. Pressure, it seems, brings about rookie mistakes. One year I attempted to create a meringue cake to share with you on my blog's first birthday. A year and a half later, I haven't recovered from the misfortune that happened in my kitchen (contrary to what my mother may believe, I'm still not ready to discuss it). This year, I've decided to learn from my past mistakes. While I can't erase the small part of me that wants to create brilliant, impressive desserts, I want to avoid disaster, disappointment, and rushing to the grocery store to grab more ingredients an hour before the event takes place (no one needs that kind of stress). This year, I am planning ahead. It seem like an obvious decision, but I've always been a last minute kind of girl, making the desserts the day or morning ahead and panicking if something goes awry. I've gotten too good at panicking. A month ago, my boyfriend convinced me we needed to buy pomegranates. After bringing them home and prying them open, I quickly decided they would be heavenly with a bit of chocolate. It took a bit of convincing for my skeptical boyfriend (and a mouth full of chocolate chips and pomegranate seeds to prove my point), but he ultimately came to the same conclusion. I put this idea on the back burner for the last month, mulling it over and trying to figure out the best presentation. I've always thought pomegranates looked like gems so the last thing I wanted to do was hide them in a dessert. This Chocolate Pomegranate Tart is the result of all the reflection and, well, reflect it does. 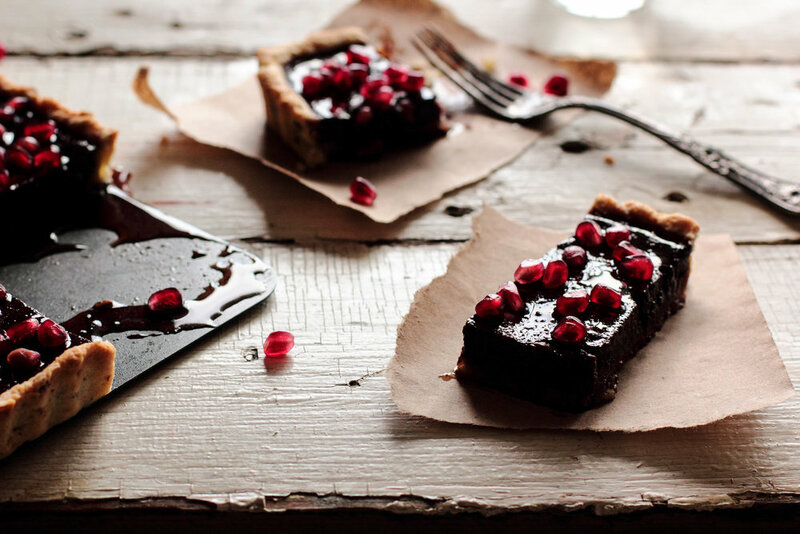 A slice of this Chocolate Pomegranate Tart brings a hint of pomegranate to a decadent chocolate tart. The crust is made with ground almonds, reminding me a bit of sugar cookies. A rich chocolate truffle filling is baked in, setting like a thick custard. 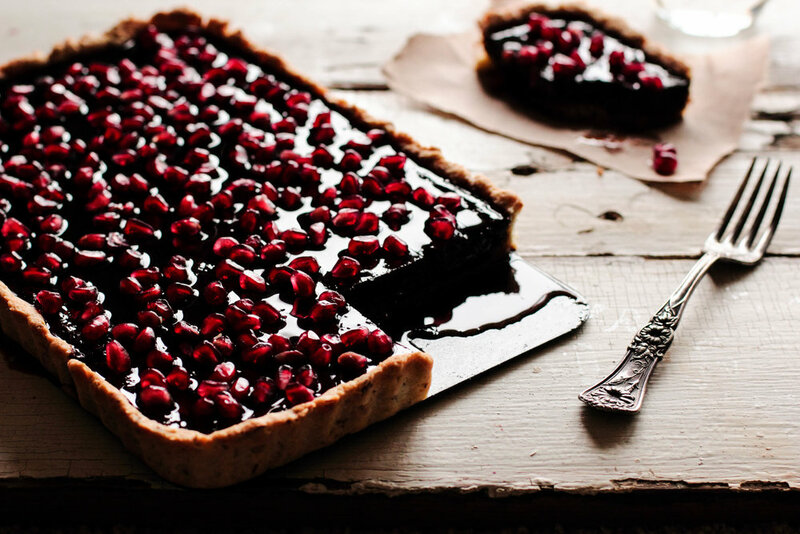 The finished tart is glazed with pomegranate juice (thickened to a syrup to strengthen the flavor) and dotted with pomegranate arils. The pomegranate seeds catch the light just so, making this a lovely tart to impress guests. In a large mixing bowl, mix together the flour, sliced almonds, salt, and sugar. Cut in the cubed butter with a pastry blender or with your hands until the dough resembles coarse sand. Mix in the egg and water until dough comes together. Press dough into a tart pan, taking care to keep the dough an even thickness. Stab the bottom several times with a fork so the dough will bake evenly in the oven. Refrigerate dough for 30 minutes to firm up. Bake the tart shell for 15 minutes, or until it is lightly colored and the shell feels dry to the touch. While the tart crust is baking, place the chocolate and heavy cream over medium-low heat and melt the chocolate, stirring constantly. Once uniform, turn off the heat and mix in the eggs, sugar, flour, and salt. Pour chocolate mixture into pre-baked tart crust and carefully place back into the oven, baking for an additional 30 minutes. In a small saucepan over medium heat, mix together the pomegranate juice and sugar. Simmer for 20-25 minutes, or until the juice thickens to about 1/2 cup. The juice will be thick and syrupy. Remove from heat. When the tart has finished baking and has cooled slightly, pour the pomegranate syrup evenly over the top. Garnish with pomegranate arils. Allow the tart to cool to room temperature in order for the glaze to set. To store, cover and refrigerate. Serve at any temperature, with a side of whipped cream. Sugar Cookie Tips & a Giveaway!